Charming Japanese pictorial map of the world with illustrations of cannibalism. 家庭教育世界一周すごろく / Home Education Round-the-World Sugoroku./ Katei kyōiku sekai isshū sugoroku. 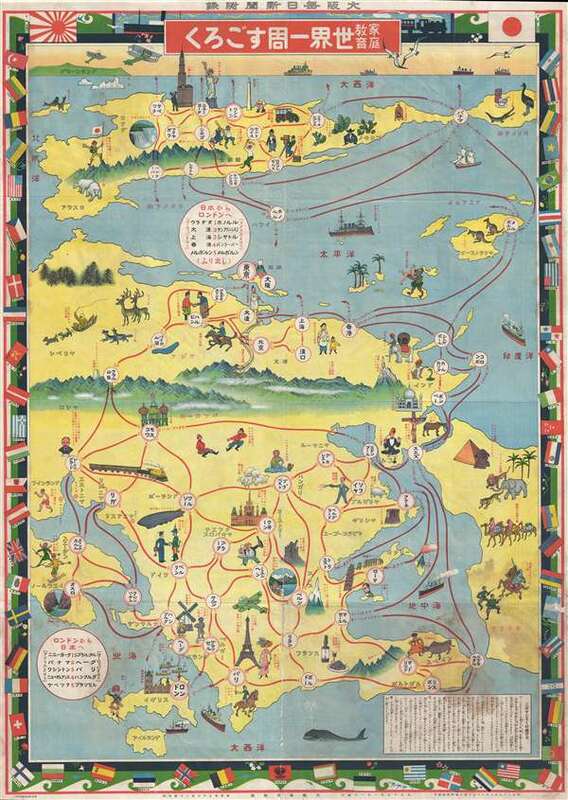 This is an exceptionally charming Taisho 15 or 1926 Japanese pictorial world map and round-the-world sugoroku game. Although somewhat distorted and not drawn to scale, this is both a game board and a map of the world. Oriented with east at the top, this map is centered on the Ural Mountains. The upper part of the game board includes India, Southeast Asia, China, Korea, Japan, Australia, and, at the very top, the Americas. The lower part includes Europe, the Mediterranean, England, and northern Africa. The whole is heavily illustrated with a host of delightful vignettes illustrating Japanese fascination with western culture, technology, and customs. Some of the vignettes also express Japanese ideas of cultural supremacy, such as the image of a gigantic dark skinned New Guinea tribesman cannibalizing a naked light skinned man. Historically there are two variants of sugoroku, one that is similar to backgammon, and the presently offered 'snakes and ladders' variant. This version of the game appeared as early as the 13th century, and was popularized by the rise of printing technology, especially in the Edo and Meiji periods, and subsequent availability of high-quality visually-arresting game boards. A standard sugoroku board has a starting point, the furi-dashi, and a winding or spiral path terminating at the agari or finish-line. In this case the furi-dashi is Japan. The traveler must make his way to London, the agari, and back to Japan. Along the way he can visit, Melbourne Australia, the Panama Canal, New York, Niagara Falls, China, Paris, Jerusalem, Rome, the Alps, and Moscow, among many other donations. The present map and game was issued in Osaka by the Osaka Mainichi Shimbun (大阪毎日新聞, Osaka Daily News). The Osaka Mainichi Shimbun (1876 – 1911) was an Osaka based daily newspaper active in the late 19th and early 20th century. The Osaka Mainichi Shimbun (大阪毎日新聞, Osaka Daily News) was founded in 1876 as Osaka Nippo. In 1888 it was renamed Osaka Mainichi Shimbun. In 1911 it merged with the Tokyo Nichi Nichi Shimbun (東京日日新聞) to become the Mainichi Shimbun (毎日新聞, Daily News). Very good. Backed on archival tissue for stability. Some minor repairs on verso. National Library of Australia, 4731156. Princeton University, Cotsen Children's Library, 38943.